Drumming Up Business, SenseWeb style. 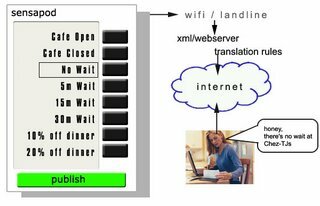 I was toying with some ideas related to the sensing internet, and thought of a customizable wall-mounted device for small businesses. This little device would be given away to the merchants. They would be custom configuered with 20-30 specials that the merchant agrees to – like a set of coupon templates they could use when they wish. 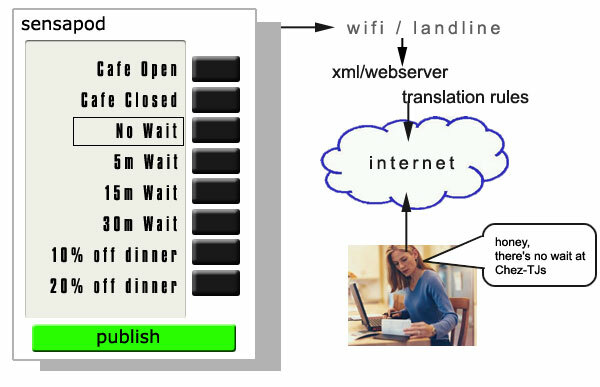 It may be based on a little wall device, or could be a web-based service. Either way, the merchant would adjust it based on how busy they are. Customers would sign up for this service motivated by the chance to get cut-rate pricing on oversupply or slow business conditions. A slow night at a restaurant might result in a half-price meal. An oversupply of Ice Cream might mean buy 1 get 2 free. A quiet bike shop might get busy if it had half-price tune ups. Free drinks to the next 15 customers might get a depressingly slow nightclub rocking again. So, the merchant would enter their password and select the coupon of choice, and click publish. The coupon would then go out via email, RSS, or SMS messages to customers who have subscribed. Merchants sending out crappy coupons would lose their subscribers, so it would be self-policing to some degree. The coupons would be time limited to 1-2 hours – and the feed on the phone would display the expiration time. There is a very interesting industry related to remote, networked sensors that seems on the verge of explosion. Check out this article on Microsoft’s plans to integrate real-life-measuring sensors into maps. It feels like one of those tip-of-the-iceburg situations. I cannot wait to see the Google Adwords Local Ad for windshield wipers that gets turned on based on rain gauge data at the store.